Faith is 6 years old and lives in Kenya. Her favorite color is white, and her favorite game is hide and seek. She lives with her grandmother and younger brother. She wants to be a nurse when she grows up. Faith is now a part of our lives, and we can't wait to get to know her more. We decided to sponsor Faith through Compassion International earlier this month. Honestly this was going to be Parker's Christmas present, but why wait? For just $38 a month, we get to help clothe, feed, provide education, and most importantly help her realize how much Jesus loves her. $38 to us is dinner and a movie on a Friday night, but for her, it's life changing. 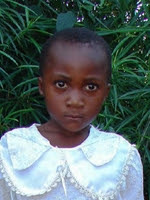 Faith waited 243 days for a sponsor, and just 2 days before her 6th birthday, God called on us to be that sponsor. We are so excited and pray we can be a light in this little girl's life. I wrote our first letter to her earlier this week, and I can't wait for someone to read it to her. We told her how loved she is by us, how much Jesus loves her, and how special He thinks she is. I have decided to now accept sponsors on my blog, and 100% of anything earned will go straight to sponsoring Faith and sending her love gifts. If you would like to help Faith or just want to sponsor Anchors Aweigh, I would love to have you! I will do everything I can to make the sponsorship productive for you, and you can check out the details below or in my Sponsors tab. If you don't want to sponsor but still want to help, that's great! Please join us in praying for Faith. Pray for her health and well-being, pray for her grandmother and younger brother whom she lives with, but most importantly, pray that Faith feels the love of Jesus and accepts Him into her heart. BEAUTIFUL idea!! :) Love it! LOVE compassion!! Justin and I sponsor a little girl from Haiti! I started sponsoring her 2 years ago in honor of my dad who had a heart for Haiti! It's such a big blessing! I love the little letters and updates they send! I've been sponsoring a little girl in Ghana for about a year. It's been such a special experience, and a really great teaching topic for my little guy. He brings her up all the time, and we pray for her every night. Such a special relationship to start building! That's so amazing that you are sponsoring Faith with blog sponsorships! I wish I had toured the Compassion International headquarters when I was in Colorado Springs! And that's so cool that her name is Faith... I feel connected to that name because my mom wanted to name me Faith. What a blessing you are able to be to that little girl!!! Nate and I are looking for an organization to sponsor through and we want to make sure it's an organization that gets the most care to the kiddos. As of now I think we'll be going through Compassion. What an amazing thing to do! I have a few charities I donate to as well, we spend the money on so many other things why not for a good cause. What an awesome idea full of compassion and love.